I buy a lot of books. Too many, my dear husband would say. I love each and every one of them. I am a godsend to second hand booksellers and those who sell new books, buying several a hundred a year through bricks and mortar bookshops and on line. I care about the condition of my books as much as content. Most booksellers I know are kind, knowledgeable and operate with the highest professional standards and integrity, whether they are selling on line or more traditionally. Many of those booksellers sell through Amazon.co.uk’s marketplace, where I have long been a stalwart customer. But here’s the thing. I hate fulfilled by Amazon. I have just spent my entire morning removing labels and their sticky residue from books supplied via Amazon marketplace from sellers using “fulfilled by Amazon” and I’m really irritated. I don’t mind spending a bit of time and money restoring and repairing old books, but if I buy a book described as “new” or “as new” I expect it, I require it, to be exactly that. If I’m buying a pre-loved or pre-read book, I expect all the faults to be disclosed in the description. I do not expect to have to spend 15 minutes gently dredging a pointless label in smelly, dangerous chemicals trying to remove labels without damaging the book cover. Sellers, if you cannot supply a book in new condition, do not describe it as such. If you are going to add an imperfection through your selling processes, disclose it in the description. 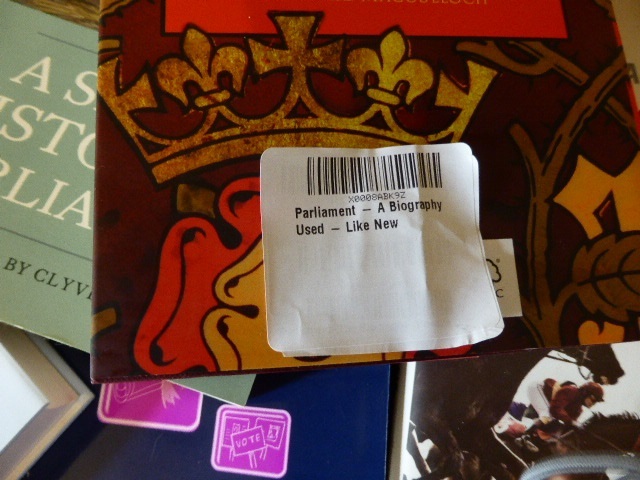 Of course, sellers may not know that Amazon apply inappropriate labels to their books (although I suggest that a bookseller who doesn’t take the care to investigate the condition in which their book will be delivered isn’t among those who I described earlier as meeting the highest standards of professionalism and integrity). As a former (and soon to be again I hope) second hand bookseller, I know just how tight margins are and how important repeat customers can be. I also know it pays to take care of your customers and supply books in the promised condition. Booksellers should be demanding that Amazon does not deliberately and routinely damage and devalue their stock. So here’s my gentle message to those booksellers who do use fulfilled by Amazon. The next time I receive a book described as ‘new’, or ‘as new’ through fulfilled by Amazon with a label that doesn’t peel away easily, that leaves a sticky, dirt-gathering residue, or where removal by peeling damages the jacket or cover, the seller will be receiving a return. And as the return will be because the goods were not as described, the seller will bear the costs of that return as well as the refund. If that doesn’t work, I will just stop buying from ‘fulfilled by Amazon’ sellers (who are fortunately marked as such on Amazon). As a book buyer, I am tired of shoddy standards in on-line book-selling, tired of being treated as second-rate customer. And as the booksellers’ friend, I am telling you that you do yourself, your customers and your industry no favours by offering sub-standard service. It’s not just the fulfilled by Amazon stickers – many of the used book-sellers on Amazon are guilty of mis-describing their books. The number of times I have complained/sent books back because their condition is not as described is too many to count. Amazon’s condition descriptions are quite clear – a VG book has to have an uncreased spine for instance – a big bug-bear of mine. I’m buying less and less used books via Amazon as a result of this. You’re quite right Annabel – it isn’t just fulfilled by Amazon. Standards in descriptions are really important, and Amazon sellers (may of whom I accept are occasional sellers parting with their own books rather than professional sellers) are among the poorest in this regard. Just how hard can it be to see if a spine is creased or pages tanned. It was just that it was this particular bugbear with fulfilled by Amazon that was top of my list today – and I do wonder how many booksellers know that Amazon do this. I’m really glad to hear that you send the books back when not up to scratch. I really must start being more diligent about that – and keeping a note of those sellers who try to pass off poor copies as something better. Sticky labels are very frustrating. I can sort of cope with UK barcode ones over a non UK barcode as they serve a purpose but others are really annoying. Years ago when Amazon first started they used to put a ‘Remember to leave a review’ sticker on everything but seem to have stopped that. ABE books are not so sticker happy. Gosh, I remember those “Remember to review” labels. They were drattedly annoying too. ABE is a conglomerate of lots of different sellers, and I find practice and standards favourable there, but in general much higher than on amazon (and it’s easier to see who to avoid – I never buy from sellers who, for instance, leave generic descriptions rather than ones specific to the book they have in hand. But ABE is now owned by Amazon, so I wonder how long it will before we start to see the same practices. I didn’t know Amazon now owned ABE. I used to like A1Books but they went out of business. I have seen some (although just now I could find any) where a seller using a generic description didn’t even change the hold text it still had ‘insert author name here’ and so on. I am very wary of fulfilled by Amazon, and careful picking Marketplace sellers. My own local purveyor of used books sells via Amazon, but I wish there was a better alternative, for him and for me. So do I. I regret the loss of UKBookWorld, but in practice I didn’t use it much, partly because too few booksellers listed there to make it a good place to find things. And of course, Amazon make the buying process so easy. Lots of individual booksellers have their own sites but unless your have an interest in a specialist area and find the right niche sellers, the idea of trawling through loads of sites to find the book you want is both daunting and impractical. If anyone has any suggestions about how buying pre-loved, used (insert whatever terminology you like) from book second hand booksellers and dealers, I’d love to hear it (I confess some self interest – I plan to start selling seriously myself again quite soon). Perhaps I should blog about that too.. Wise advice though Fleur, I think, about being cautious about Amazon marketplace if you care about the condition of books. Having had a recent rant about sticky labels myself – as you know – I’m staggered to hear that Fulfilled by Amazon uses labels in this way. I only buy from Amazon if I can’t find a book anywhere else as the variety in standards used by their sellers is far too wide. Even then I often google the seller’s name to see if they have their own site. They do it for the Vine Programme too…but as those books can’t be passed on or sold, it matters less, but it still annoys me. Googling sellers is a very good idea and one which I shall now claim as my own!